This quintet hailing from Gothenbourg, Sweden, offers a soothing, atmospheric, and dense form of post-rock, comparable to bands like Mono or Yndi Halda. With six tracks clocking in at 55 minutes, this release is certainly not bad; it offers tracks which are relaxing, rhythmic, interesting, and dynamic, but ultimately, remain unmemorable. I’m not quite ready to condemn the band to death, however, as it does seem to meet its stated objective. The album does tend to grow on the listener after repeat listens, and it is a rewarding experience to come to appreciate the delicateness of these melodies, as they are quite subtle. It is a solid debut, but still nothing completely earth shattering, although I would recommend Give me Beauty... as a good album to chill out to (possibly while indulging in some stereotypical, late night, illegal inhalations.) The tones, textures, rhythms, and arrangements are not entirely original and will not leave you aching for the next opportunity to listen again. 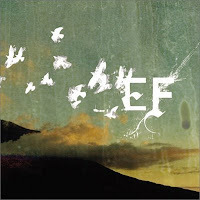 Sonically, Ef offers a pleasant mix of ambient noise, guitar tremolo, and sparkling dynamism all underlain with slow, tribal drums and strings. Ef may be at their best when they make use of the addition of duel male/female vox, which are unfortunately used sparingly, and seem rather out of place when one considers them in context of the whole composition. The epic, 12:17 long track, "Hello Scotland", reaches several grand climaxes, but suffers from weak transitions. In the equally epic "Final Touch / Hidden Agenda", the band comes together in the perfect synergy of lulling ambience, rocking beats, gentle guitars, duel vocals, a hint of melodica, (or perhaps accordion, either way, Swedes always tend to use these instruments well) and convincing, appropriate climaxes. I don’t intend for this to come off too negative, for there is truly a lot on this album to enjoy. It seems, however, to be representative of the kind of run-of-the-mill, mediocre output that we are presently witnessing coming out in the ‘post-rock’ genre. Although the music is listenable, and the musicians proficient, the creativity and groundbreaking originality I associate with genre defining artists (such as GY!BE, EITS, ASMZ, Mogwai, etc.) is no longer present in 90% of the albums currently coming out. As the output of bands under the umbrella of post-rock expands exponentially, the ubiquity of such mediocre releases strikes me as worrisome for a genre that is, hopefully, in its infancy. Man, who has ever plumbed the far depths of your being? How strange the secrets you preserve so jealously? Lateral Noise does not store any files on this host/server . None of the albums posted has anything to do with Blogspot nor the Administrators of this blog. We encourage you to support the artists and buy their albums if you like them. The postings are for promotional and preview purposes only and all the albums downloaded from here should be deleted within 24 hours. If any of the promotioned artists want their album's links to be removed email us here. You can send us your comments or requests here! Dirge | Interview With Stéphane L.